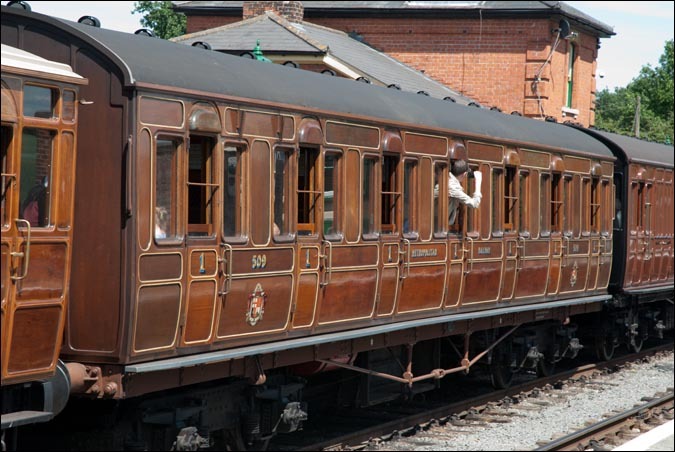 The Epping and Ongar Railway is one of, if not the the newest heritage railways in 2013. But this event was up with the best of them. This railway was part of the London Under Ground Central Line, even if all of this part is above ground. This railway when it was built, was pehaps three or four stations to far out of London. The green belt round London, stopped houses being built on farm land this far out. The undergrounds Central Line now stops at Epping under ground station. The Epping and Ongar being an ex under ground railway was always going to be one of the heritage railways short listed to take part in "Tube150" celebrations. 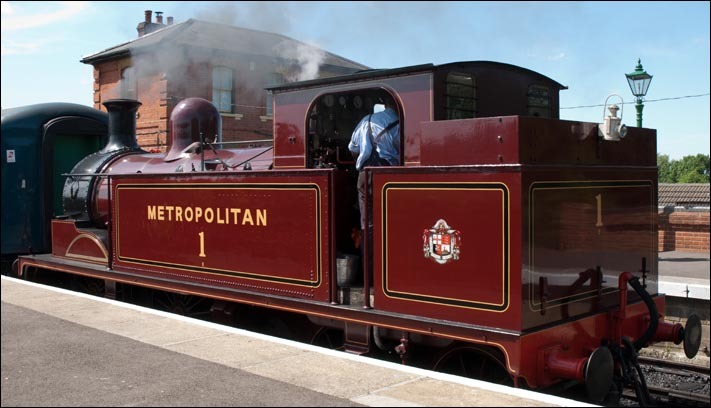 The Star locomotive of this event has been 0-4-0T Metropolitan No.1 which steamed through the Underground early one morning in 2013. To add to the line up Met 1 and Coach 353 and the 2 Metropolitan Dreadnought coaches and a BR Suburban Brake Standard coach came to the railway. Also at this event was "LT 150" a GWR 2-6-2T that has been repainted in LT red. N2 no.1744 also came from the Great Central Railway, plus 6141 a GWR tank locomotive. 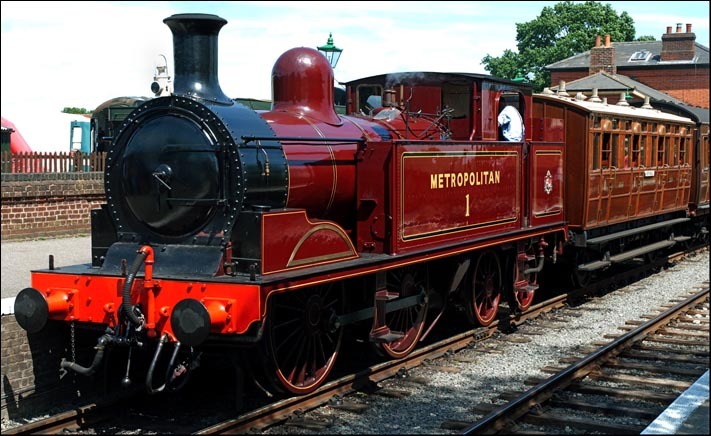 The Metropolitan Railway E Class . A total of 7 of these 0-4-4T steam locomotives were built between 1896 and 1901 for The Metropolitan Railway. Number 1 is based at the Buckinghamshire Railway Centre. No. 1 was loaned in 2013 to the London Tranport museum, so it could do l trips in steam between Olympia and Moorgate via Edgware Road over successive weekends in January 2013 to mark the 150th Anniversary of the London Underground. The early morning commutors must have got a shock when No 1 went by! London Transport Museum restored carriage No. 353 as part of the the 150th anniversary of the Underground to a very high standard. It is a four-wheeled first class carriage that was built in 1892. It was on a bit of tour round some of the railways with Metropolitain No.1. 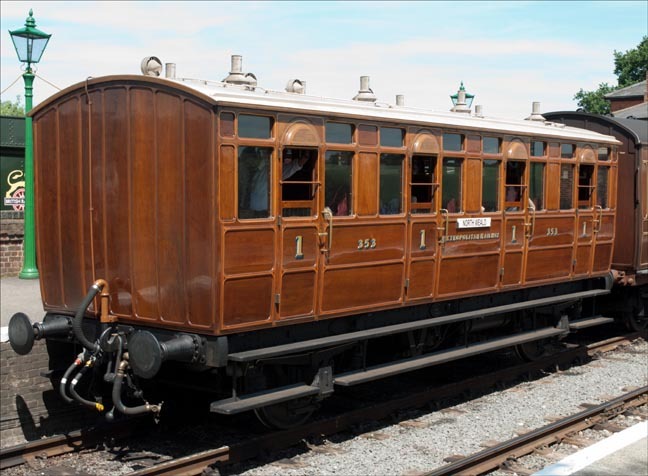 This 1st class Metropolitain coach no.509 is a seven-compartment First that was built in 1923. It was also at The Epping and Ongar railway at North Weald station in 2013.